We should all ride safely and obey the traffic laws, but let’s face it sooner or later we’re all going to get a ticket for something. Don’t let it ruin your day. Worse things can happen when you’re driving, especially if you’re on a bike. 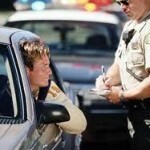 Bikers can get traffic tickets for everything a car driver can as well as citations specific to motorcycles. Common moving violations for cars or bikes are speeding, crossing a yellow line, changing lanes while crossing an intersection, not staying in the correct lane during a left turn, failing to signal a turn or lane change, etc. But bikers can also get tickets for splitting a lane (riding side by side), loud pipes, vertical tag, and my favorite: wheelies. And lately, I’m handling more and more cases of excessive speeding, like 130 and 160 mph. Man, these new rockets really scream. DO put on your blinker and move to the right lane. If a side street or parking lot is available, use it. If you have to drive a couple of blocks for a good spot, this is usually permissible. DO turn off your bike or car. DON’T get off the bike or out of your car. DO wait patiently for the officer to come to you. Never go to meet the officer halfway. DON’T ever try to shake hands with an officer. DON’T show frustration or anger. The officer is going to ask for your license, registration and proof of insurance. DON’T start digging for it until the officer asks for it, and be sure you can produce them quickly. DO answer the officer’s questions BUT only with brief, non-committal responses. Q – Do you know how fast you were going? Answer – “Yes.” DON’T say your speed, especially if you were speeding! Let the officer state how fast he/she thinks you were going. Q – Do you know what the speed limit is? Answer – “Please tell me.” Now use your non-committal nod again. If, and only if, you’re sure of the speed limit, your answer is “Yes,” and then be ready to state it if further questioned. But, I can defend “please tell me” just fine. DON’T comment, argue, debate, etc. DON’T say anything! If you must say something, just nod you head in an “okay if you say so” way. DO sign the ticket! Signing the ticket does not mean you agree with the citation; it only acknowledges you received the ticket. Refusing to sign the ticket is a second degree misdemeanor. DON’T make any final commentary, just sign the ticket and politely leave when the officer is finished. DON’T run from the officers! I have several clients on fast bikes that tried to run. It makes a non criminal traffic ticket into a third degree felony. Just pull over and take the ticket, even if it means going to jail for the night for something other than the ticket. I don’t care if you’re wanted, carrying drugs, drunk, whatever, don’t run. It always makes your case worse. Hire an attorney and let them work it out. It’s always cheaper and better to pull over and take the ticket! Anytime you’re interacting with a police officer you should show respect even if you disagree with their actions. Remember their job is to issue citations. It’s the judge’s job to determine if the citation is valid or not. So, don’t waist your time arguing with the officer. Most officers have already made up their minds whether you’re getting a warning or a ticket before they approach you. So, take the ticket, and enjoy the rest of your ride. Also, you should remember to smile; now days it’s likely you’re being video taped.